Funny "documentary". Remember, it is 1975 year and everything in this short anime smells like 70's. Animation is quite good, reminds me American comics animation of that time. It is old school, so do not expect much. 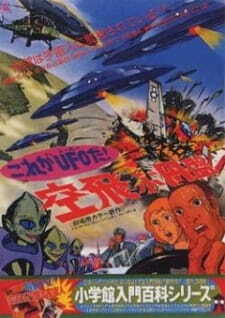 In this short anime you can find all the stereotypes about UFO: like brain washing and funny alien faces and so on. Everything in this documentary is shown like serious and scary (Oh, 70's xD ), so nowadays it can be considered even more funny and silly. Still it clearly shows the attitude of 70's people to UFO - to them it was scary and unknown. If you are interested in aliens race, history and invasions or "real" knowledge about aliens - do not waste your time. This anime is about PEOPLE attitude toward aliens in 70's. It is old school. Take it or leave it. If you decided to watch it - enjoy. This 15min will be entertaining and full of funny stereotypes, nice art and strange sounds. No real character development but you will know better how people of that time imagined UFO. This "documentary" is bogged down by poor production and laughable "facts". You can still get enjoyment out of this film, just not through conventional means. Imagine it akin to cult classics like Plan 9 or Reefer Madness, take your intoxicant of choice and just bask in how awful it is. It's only 16 minutes long, and it could make a "great" palate cleanser between two feature length (hopefully equally bad) movies. If by chance you are actually looking to learn about UFOs, well...I wouldn't recommend this. You would learn more from X-Files reruns than Kore ga UFO da! While today we still have sensationalist shows like "Ancient Aliens" that try to twist around questionable half-truths to fit their narrative, back in the 1970's the fad of UFO sightings was much more the rage than it was today. The findings of the US government "Project Blue Book" were on everyone's minds, and it seems you would hear of some sort of UFO sighting, alien abduction, or cow mutilation or some other sort of woo every other day. Project Blue Book was a US government program that recorded and cataloged these unexplained phenomenon, in order to try and see if there was something to this whole UFO thing. Started around the end of WWII and running up until 1970, over 12,000 UFO sightings were investigated. And they were able to identify all but 700 of them (airplanes, cloud formations, etc). But once word of those unidentified 700 became public, along with the growing media fascination with all things unexplainable...well, you get the idea. In 1978, there was even a prime time television program that I remember watching, called "Project U.F.O. ", where two agents would travel the country to investigate these phenomena (based on Project Blue Book). Sort of a precursor to the X-Files, only more serious and documentary/docudrama-style. This 16-minute anime short, "It's a UFO! ", fits perfectly into that narrative. Based on actual sightings (such as the famous Hill abduction), it spins a story of UFO sightings increasing across the globe. Mixing in speculation with observations, and presenting them as "facts" in a documentary format, all one-sided of course. Looking back on it now, it all seems sort of silly and quaint. But for those of us who lived through the Seventies, this all fits right in with all the woo that was being passed off during that time. Think of this little anime snippet as sort of a time capsule in the public consciousness of the era.